Renal tubulopathies provide insights into the inner workings of the kidney, yet also pose therapeutic challenges. 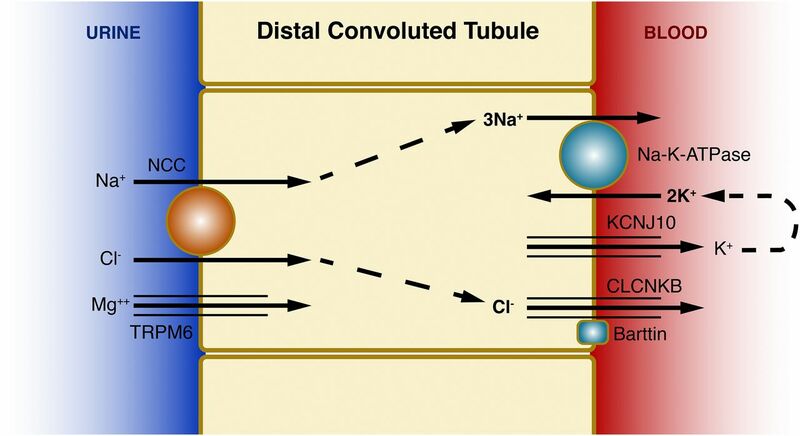 Because of the central nature of sodium in tubular transport physiology, disorders of sodium handling may affect virtually all aspects of the homeostatic functions of the kidney. Yet, owing to the rarity of these disorders, little clinical evidence regarding treatment exists. Consequently, treatment can vary widely between individual physicians and centers and is based mainly on understanding of renal physiology, reported clinical observations, and individual experiences. Salt-losing tubulopathies can affect all tubular segments, from the proximal tubule to the collecting duct. But the more frequently observed disorders are Bartter and Gitelman syndrome, which affect salt transport in the thick ascending limb of Henle’s loop and/or the distal convoluted tubule, and these disorders generate the greatest controversies regarding management. Here, we review clinical and molecular aspects of salt-losing tubulopathies and discuss novel insights provided mainly by genetic investigations and retrospective clinical reviews. Additionally, we discuss controversial topics in the management of these disorders to highlight areas of importance for future clinical trials. International collaboration will be required to perform clinical studies to inform the treatment of these rare disorders. The importance of tubular sodium reabsorption becomes especially apparent when the system is disturbed, as in the salt-losing tubulopathies. On the basis of anatomic and functional characteristics, the tubules are typically divided into four main segments: proximal tubule (PT), thick ascending limb (TAL) of Henle's loop, distal convoluted tubule (DCT), and collecting duct (CD). Genetic or acquired defects in salt transport in any of these segments lead to distinct tubulopathies, which have characteristic clinical and biochemical features (Figure 1). 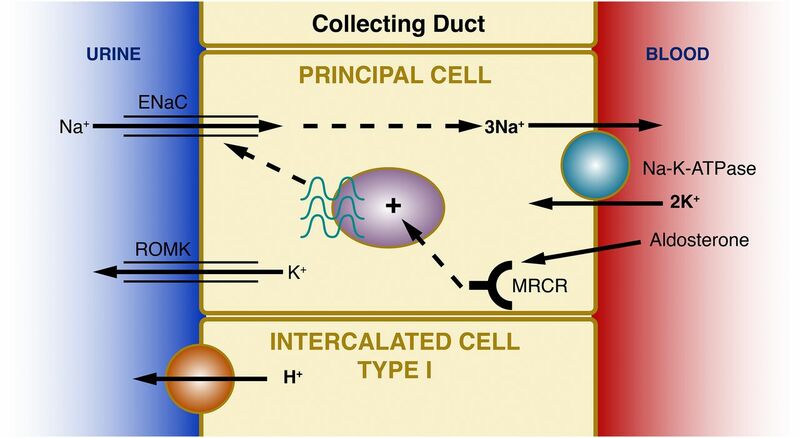 Here, we will review key advances in our understanding of the different renal genetic disorders affecting salt (sodium chloride) reabsorption with respect to both clinical phenotype and underlying pathophysiology. An overview of these disorders, the underlying genes, and key clinical characteristics is given in Table 1. In addition, we will highlight some clinical controversies around the treatment of salt-losing tubulopathies, which need further clinical studies and which are summarized in Table 2. The PT is the part of the nephron where the most diverse action with respect to reabsorption (as well as secretion) takes place (Figure 2). Micropuncture studies suggest that between 60% and 80% of all filtered salt and water is reabsorbed in this segment.5 The “engine” for salt transport, as in all tubular segments, is the basolateral Na+-K+-ATPase, which establishes the electrochemical gradient for sodium entry into the cell. The Fanconi renotubular syndrome (FRTS) represents global dysfunction of the PT and, because of the high energy demand of this transport process, is often associated with disorders of impaired energy supply, such as mitochondrial cytopathies.6 But, aside from being a secondary feature of systemic disorders, FRTS can also occur in primary form. Currently, OMIM lists three such forms of FRTS (see Table 1): FRTS1 is dominantly inherited and typically presents in childhood with rickets and the typical biochemical abnormalities of FRTS. Progressive CKD is typically observed with development of CKD stage 5 in adulthood. Although the underlying gene has been linked to a locus on chromosome 15, the identity of this gene remains to be revealed.7 FRTS2 previously referred to FRTS observed in two siblings with a homozygous mutation in SLC34A1.8 Yet, recessive mutations in this gene were subsequently found to cause infantile hypercalciuria and the association with FRTS has been questioned.9 A unique aspect of PT energy utilization was highlighted by our discovery of the molecular basis of FRTS type 3, where a heterozygous missense mutation in EHHADH (encoding enoyl-CoA hydratase and 3-hydroxyacyl CoA dehydrogenase) impairs mitochondrial fatty acid oxidation.10,11 Although this defect is global it only manifests in the PT, because the PT does not utilize glucose for energy generation, exposing the dependency on fatty acid oxidation.12 Patients typically present in childhood with rickets and the biochemical abnormalities. In contrast to FRTS1, however, no progressive CKD has been observed.13 FRTS4 is caused by a specific mutation (R76W, also annotated as R63W, depending on reference sequence) in the transcription factor HNF4A.14 Mutations in this gene are associated with abnormalities in insulin secretion, typically hyperinsulinemic hypoglycemia manifesting in the neonatal period and diabetes (MODY type 1) later in life. Consequently, patients with FRTS4 usually manifest shortly after birth with hypoglycemia and subsequent investigations then reveal the FRTS.15,16 The association of FRTS4 with only this one specific mutation (all other described HNF4A mutations are only associated with altered insulin secretion) raises interesting questions over the specific role of R76 for the function of HNF4A in the maintenance of proximal tubular function, but, so far, no insights have been published. Patients with FRTS exhibit proteinuria. This primarily reflects “tubular” proteinuria, i.e., the impaired reabsorption of filtered proteins, but in some patients proteinuria reaches the nephrotic range. Although the exact amount of physiologic tubular protein (including albumin) reabsorption remains controversial and may approach several grams per day,30 some patients also show evidence of glomerular damage.31,32 Should these patients be treated with so-called anti-proteinuric drugs, such as ACEi or ARB? Given the impaired sodium reabsorption in FRTS and thus risk of loss of volume homeostasis, are such treatments, which are generally recommended for proteinuria in CKD, of benefit to patients with rare tubular salt-losing disorders? From the PT, the primary urine traverses into the thin limb of the loop of Henle. 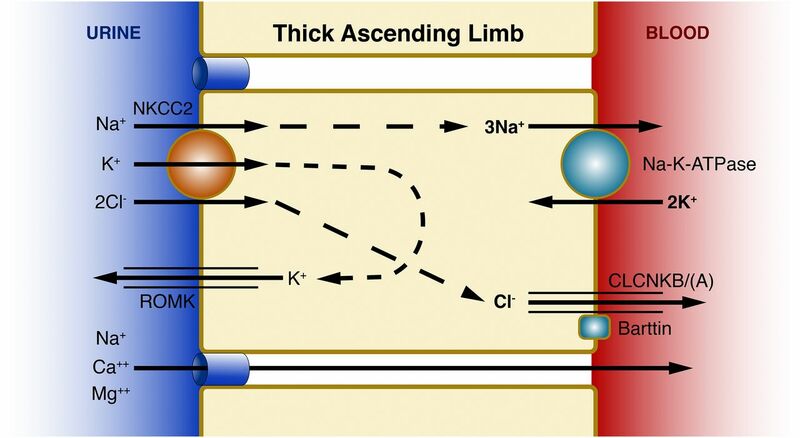 So far, no human disorders have been associated with altered salt transport here, so we will concentrate on the thick ascending limb (TAL, Figure 3). Previously, transient forms of antenatal BS have been described, but it was only recently that a genetic explanation for a subset of these patients was identified: loss-of-function mutations in the melanoma-associated antigen-D2 (MAGED2).47 It appears that the encoded protein is an important regulator of tubular salt reabsorption in TAL and DCT in the ante- and perinatal period, but not thereafter. The gene maps to the X-chromosome and pregnancies with affected boys are prominently characterized by severe polyhydramnios.47 After delivery, polyuria persists with hypokalemic alkalosis, but symptoms resolve spontaneously during the first few months of life. Why there seems to be separate regulation of tubular transport before and after birth, and what role exactly MAGED2 plays in this process, remain to be elucidated. Hypertrophy of the juxtaglomerular apparatus (JGA) was already part of the original description of BS.48 The JGA is at the interface of glomerular and tubular function and mediates tubuloglomerular feedback (TGF) and essentially constitutes the “volume sensor” of the kidney, where on the basis of tubular sensing, renin release and glomerular filtration are regulated.49 The tubular component of the JGA is the macula densa and chloride transport is a key initial signaling pathway: decreased chloride availability indicates inadequate filtration and leads to activation of the TGF with consequent renin release and afferent arteriolar dilatation with hyperfiltration through a number of intermediate steps, most prominently the production of PG E2 (PGE2) by cyclooxygenase-2 (COX2).50,51 This elevated COX2 activity is the basis for treatment of BS with PG synthesis inhibitors. Importantly, because macula densa cells are part of the TAL, mutational effects are present here as well, leading in essence to a short-circuit of TGF, as chloride reabsorption is genetically impaired in BS. Consequently, renin release and regulation of filtration are essentially uncoupled from volume status in BS, because the volume sensor is defective. PGE2 production appears be highest in BS types 1 and 2, which led to the proposal of the term “hyperprostaglandin E syndrome” for these BS subforms.37 Yet, despite the lower PG levels, the hypokalemic alkalosis is typically much more pronounced in BS type 3 compared with types 1 and 2.38,52 The reasons for this are not quite clear: is it, because CLCNKB is expressed also beyond TAL in the DCT, thus impairing salt transport in two nephron segments?35 But why then is it typically the “milder” form with later onset? Do patients with BS type 3 have higher aldosterone levels, despite lower PGE2? If so, what triggers the aldosterone production? Further investigations are needed to better understand the often dramatic electrolyte abnormalities in BS3. Obviously, this controversy extends beyond potassium-sparing diuretics, but also concerns the use of angiotensin converting enzyme inhibitors and angiotensin receptor blockers. Although not commonly used in BS, physicians may be inclined to use them in those patients who develop proteinuria, especially if the biopsy reveals glomerulosclerosis.46 Whether these medications at this stage can help protect kidney function that could justify the risk of hypotension is yet another open question. Another treatment dilemma occurs in patients with BS complicated by a nephrogenic diabetes insipidus (NDI)–like phenotype. The TAL is critical for urinary dilution and the establishment of the interstitial concentration gradient.60 Consequently, isosthenuria, the inability to either dilute or concentrate the urine, would be expected in BS and is indeed present in many of them. However, there are some patients with NDI-like features, i.e., with a urine osmolality <200 mosm/kg and an inability to concentrate the urine after administration of DDAVP.61,62 Misdiagnosis of such patients with BS as primary NDI has been reported and we therefore suggested the term “secondary inherited NDI.”63 Presumably, the urinary dilution is mediated by a hypertrophied DCT, but the unresponsiveness to DDAVP remains to be clarified. Clinically, these patients present a treatment dilemma: salt supplementation is usually a key component of the treatment of BS, but contraindicated in NDI. In our own clinical experience, salt supplements are poorly tolerated by these patients, and often associated with hypernatremia and increased thirst (unpublished observations). In the infantile period, clinical observations demonstrate an often dramatic improvement from PGE2 inhibition: it reduces polyuria, improves the electrolyte abnormalities, and ameliorates the failure to thrive.64 However, which drug should be used? The most commonly prescribed drug in BS is indomethacin due to its described efficacy with respect to decreased polyuria, improved growth, and electrolyte control.67,68 Yet, it can also be associated with severe side effects, especially gastrointestinal, such as gastric ulcer, necrotizing enterocolitis, and gut perforation.69 Moreover, long-term use as pain medication is associated with CKD.70 The identification of the critical role of COX2 in the excess production of PGs in BS established selective COX2 inhibitors, the so-called “coxibs,” as a promising new treatment option.71 Indeed, successful treatment with these drugs has been recurrently reported.69,72,73 However, with the realization of the increased cardiovascular mortality with selective compared with nonselective COX inhibitors, at least in adults, and the subsequent withdrawal of rofecoxib from the market, the use of the coxibs in BS has remained controversial. In one retrospective review of 28 patients with BS or GS, rofecoxib use was associated with higher BP compared with indomethacin, although in both groups BP was still below the average.74 It remains to be determined what poses the greater threat to patients with BS: the risk of gastrointestinal and/or renal side effects, or the potentially increased cardiovascular mortality. Yet, even with regard to the renal side effects, there is some controversy: retrospective reviews have revealed that a substantial subset of patients (up to 25%) with BS develop CKD.46,52 The reasons for this may include prematurity and indomethacin nephrotoxicity. Yet, interestingly, if biopsies are performed, these typically do not reveal the tubulointerstitial changes expected from indomethacin toxicity, but often glomerulosclerosis.46,75 Consequently, it has been speculated that the persistent elevation of PGs with consequent glomerular hyperfiltration and elevated renin and aldosterone may contribute to this glomerular damage, and that life-long treatment with PG synthesis inhibitors may therefore actually protect, rather than impair, long-term kidney function.71,75,76 Lastly, the antenatal treatment of BS has been reported in isolated cases.77,78 Yet, whether there is true benefit from this early treatment which justifies the increased risk of potential complications such as necrotizing enterocolitis remains controversial. As in BS, it remains controversial what level of plasma potassium is acceptable in GS. Similarly, to what degree should magnesium levels be normalized? This is especially important in EAST syndrome, because the seizures may be attributed to hypomagnesemia. Yet, in our experience, seizures occur in EAST syndrome independent of plasma magnesium levels and, similarly, symptoms of GS cannot be correlated with the degree of electrolyte abnormalities.83,85 An increase in plasma levels after oral supplementation results in increased glomerular filtration and thus increased renal losses, leading to a virtual impossibility in many patients to normalize plasma levels with oral supplementation. Much has been learned about salt-losing tubulopathies, catalyzed by the recent advances in genetics, which has led to the identification of most of the underlying genes. However, clinical observations in genotyped patients continue to raise questions about specific aspects of the roles of these genes. Most importantly, despite the ever more detailed insights into human physiology, treatment for most these disorders is highly variable between physicians and sometimes even controversial. Fundamental questions, such as whether hypokalemia or hypovolemia pose a graver threat to patients with BS and GS, remain open. Because of the rarity of these disorders, solid clinical evidence is usually not available and it is the anecdotal experience that often influences the individual physician.101 National and international efforts, such as the United Kingdom registry for rare renal diseases (www.rarerenal.org), the Kidney Disease Improving Global Outcomes expert consensus conference on GS,83 and the European Reference Network for rare diseases (http://ec.europa.eu/health/rare_diseases/european_reference_networks/erf_en), are important initiatives to improve the systematic collection of evidence and provide a framework for the development of rational and improved treatments. In this review, we have tried to highlight controversial topics in the management of these disorders, which could inform the development of future clinical trials. This work was supported by the European Union, FP7 (grant agreement 2012-305608 “European Consortium for High-Throughput Research in Rare Kidney Diseases [EURenOmics]”).